In this tutorial we are going to discover how to use a small c library written by ourselves inside Firefox. This tutorial assumes that you have a working GNU/Linux distribution with a gcc environment installed. Here we use Ubuntu, however all the steps must work for any POSIX system in which the Add-ons SDK runs. 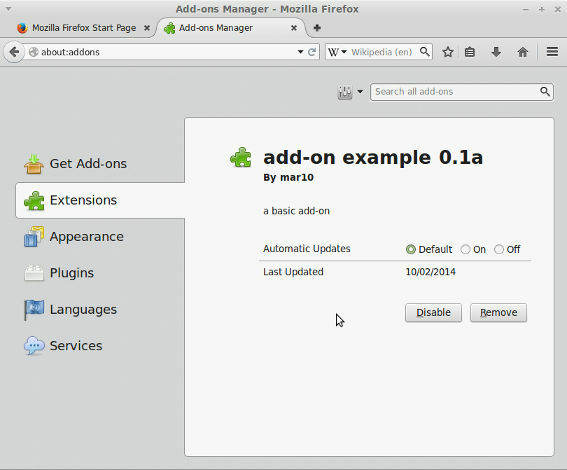 Please go to Mozilla Add-ons SDK to get familiar with the SDK and specially with the cfx tool. We could use any system library (shared object) in order to demonstrate how to use the Add-ons SDK. However I prefer the long way. We start by coding our own c-library. After that, we will start with the add-on. This code just prints the sum of two numbers. Each time this function is called, it will append a new line to file output.txt. Note that now we have a shared object (libexample.so) that must be installed in the target system in order to be consumed by Firefox. This means that you have successfully installed libexample.so, and that your system will be able to load libexample.so when asked by an application. It must print 1 + 2 = 3. You can change the information contained in packaje.json. 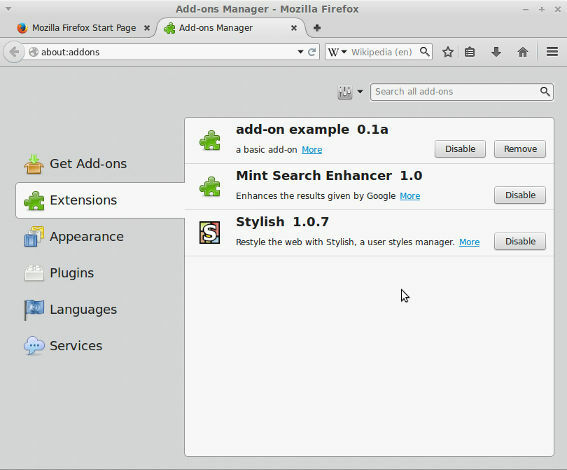 These fields will be visible inside the Firefox’s add-ons manager. The value of the "name" field will be used by the cfx tool to name the xpi add-on file. Perhaps you will find more information coming from Firefox, i.e. some GLib-GObject warnings. Don’t pay attention to those messages. At the same directory, you will find the output.txt file with the same information you just saw at the terminal! This creates the mar10_add-on.xpi file. Now you can import this add-on to Firefox. click open. 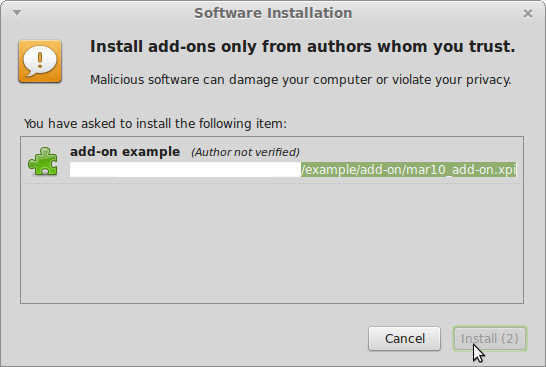 In my case the add-on is mar10_add-on.xpi. A new window will appear. Click Install Now. Once the add-on is installed, our library libexample.so is executed each time Firefox is initiated, inclusive at the moment the add-on was installed!!! The content of output.txt must be: 1 + 2 = 3, awesome!!!. Each time you start Firefox, you will append a new line with the same content to output.txt. The output.txt file will be created inside the directory that you use to call Firefox. If you run Firefox by clicking over an icon in the desktop or via another graphic element, the output.txt file will be created at $HOME directory. As you can see, this add-on is almost useless. There is no interaction with the browser, or with the user. However, now you are able to compile and load native libraries in Firefox!!! Here you can get the code of this tutorial. A copy of the license can be found here.